Jackie and I have been lucky the past year to have a few times during the week when we've been able to meeting up for lunch downtown. She turned me on to this great River North Japanese restaurant that's just around the block from her work and my new favorite meal, the bento box. OYSY Sushi is located at Grand & Rush just a block west of Michigan and two blocks east of the Grand Red Line station. A great small restaurant tucked behind Eately, this is a perfect lunch spot for your on the go work day. Jackie turned me on to their $13 lunch bento box which includes a main dish plus California Maki, Spicy Tuna Maki, Shrimp and Veg Tempura, Edamame, Japanese Green Salad and Miso Soup. 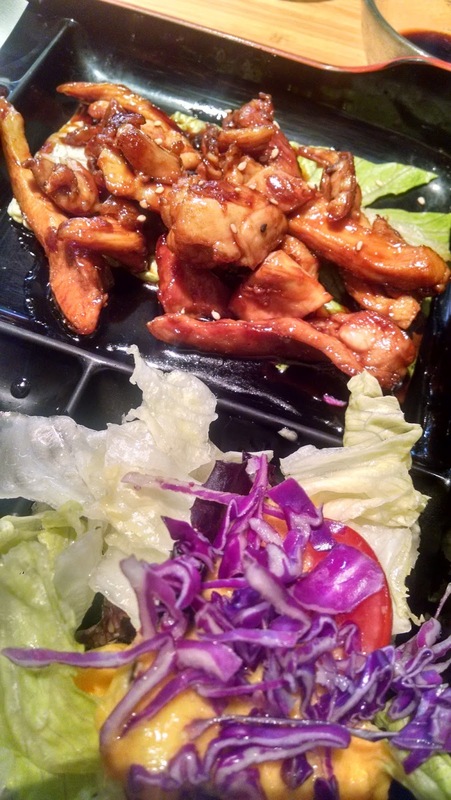 I've always gotten the Chicken Teriyaki and she always opts for the Salmon Teriyaki. Jackie was kind enough the first time to let me try a bite of her salmon and it was fabulous. 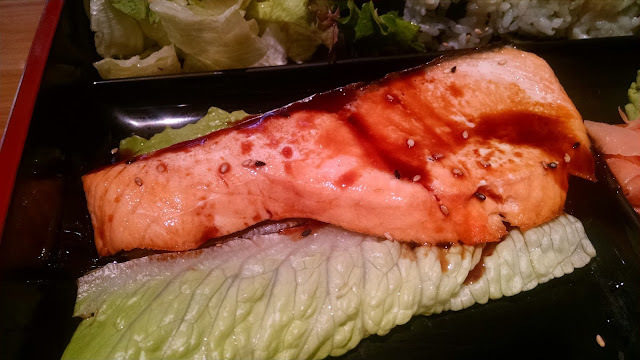 If I didn't love the chicken so much I'd definitely get the salmon. While I've never branched out and tried any of the other main dishes or other sushi items if the two rolls are any indication the rest of the sushi is just as good. The Spicy Tuna Maki has just enough spice without killing your taste buds for the rest of the plate and the California Maki always has two of my favorite fresh roll ingredients, crab and cucumber. 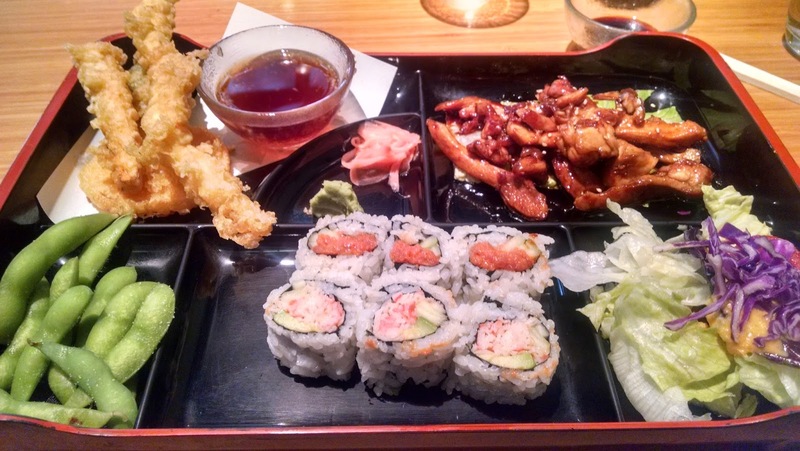 I really enjoy the entire bento but my favorite item is probably the tempura Veg and Shrimp. Who can go wrong with anything fried? 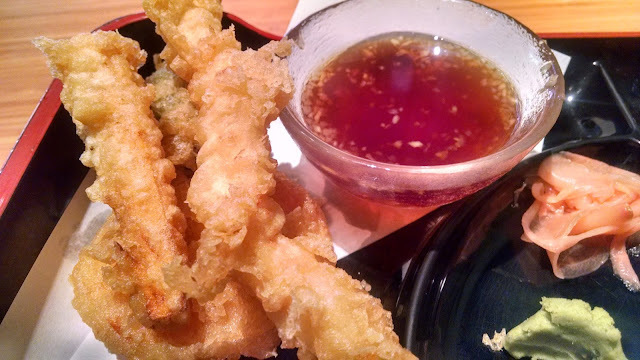 I've had veggie tempura at places where the veggies were still too crunchy but at OYSY they're perfectly cooked and hit just the right level of softness. 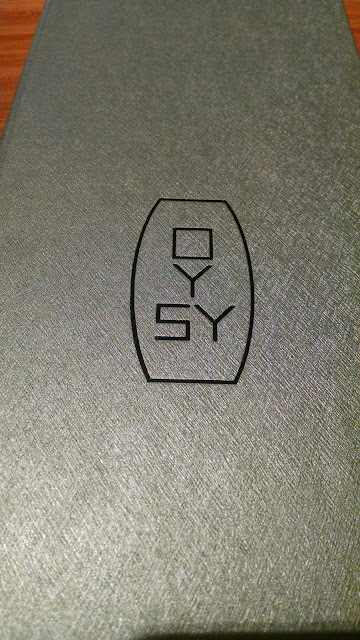 Next time you're in need of lunch a well priced delicious lunch in River North check out OYSY Sushi.